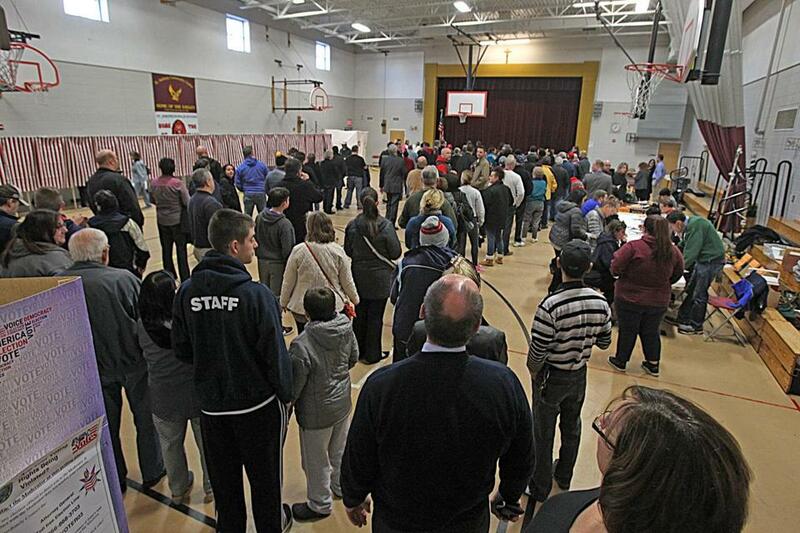 A long line of voters formed on Election Day at Memorial High School in Manchester, N.H.
“Serious voter fraud in Virginia, New Hampshire, and California — so why isn’t the media reporting on this? Serious bias — big problem!” Trump tweeted Sunday. No one in New Hampshire seemed to have any idea what he was talking about. Not the incoming Republican governor. Not the New Hampshire Democratic Party chairman. Not state election officials. New Hampshire voters set a record for turnout in the election earlier this month. More than 732,000 voters participated in the presidential election. Democrat Hillary Clinton won the state’s four electoral votes by just a third of a percentage point. And while there were some complaints of people voting in the wrong location, there were no accusations of anything involving systemic fraud, said New Hampshire Deputy Secretary of State Dave Scanlan. “We have some isolated complaints about the election we have passed on to the state attorney general’s office, but there is nothing about widespread issues,” Scanlan said. New Hampshire Democratic Party chairman Ray Buckley said Trump’s unsubstantiated claim of voter fraud was “an insult” to the state’s voters. New Hampshire political figures weren’t alone in their head scratching Monday over the Trump tweet. Officials in the other states he cited, California and Virginia, also said they didn’t know what the incoming president was referring to. Clinton won in those states also. Trump officials in New York and former Trump campaign staff in New Hampshire didn’t respond to requests for more information. On Monday Trump was meeting with a number of potential cabinet members at Trump Tower in New York. With no further word from Trump about what he meant, New Hampshire officials were left to simply guess what he could be talking about. There is already an effort underway to drop the state’s same-day voter registration option, which allows new voters to sign up on Election Day and then vote in that election. Republicans have long wanted to do away with this option, arguing that it could contribute to fraud by would-be voters who don’t intend to stay in the state. The GOP has been thwarted by Democratic governors for the past dozen years, but Governor-elect Chris Sununu, a Republican, has indicated he wants to do away with it. In the past two presidential elections, roughly 10 percent of voters were among those who registered to vote at the polls. The presidential race and the state’s US Senate and gubernatorial contests this month were all decided by less than that amount. New Hampshire is among 14 states have same-day voter registration, including Connecticut and Maine. New Hampshire voters are also required to show ID at the polls, a new measure enacted as a method of thwarting fraud. Scanlan, at the New Hampshire secretary of state office, noted that there have long been stories about busloads of people from Massachusetts driving into New Hampshire and registering to vote on Election Day. “We never had any evidence of that actually happening, but Republicans have been long frustrated of the idea that they think it could happen,” Scanlan said. New Hampshire enacted same-day voter registration as a way to avoid the 1990s-era “Motor Voter” law that required states to allow voters to register to vote at motor vehicles offices. Granite State officials said it would be too expensive to administer. If the same-day registration option is removed, it is unclear how the state would comply with federal law. James Pindell can be reached at james.pindell@globe.com. Follow him on Twitter @jamespindell.Click here to subscribe to his Ground Game newsletter.